I haven't watched Must-See Comedy Night Done Right since Scrubs was dropped by NBC and The Office stopped being funny, so I was initially hesitant to watch the Peacock's newest sitcom, Community, when it debuted this past fall. Plus, it was going up against Bones, and at the time the crime procedural took precedence over the community college newbie, but Community continued to get a lot of praise from critics and friends, so I tried to catch up when I could. Then Bones started to stink up the joint, and this past week I decided to watch Community live. While "The Art of Discourse" wasn't the show's best outing, it was still way better than last week's Bones episode, and I seriously started to rethink my Thursday night viewing schedule. 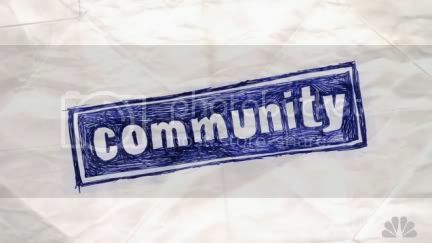 Before I decided to make Community my go-to Thursday night show, I wanted to catch up on the rest of season 1, which I was able to do online, and all I can say is the show lives up to the hype. The freshman season started out kind of slow, and once I got used to Jeff and Britta's pretentiousness, the show became funny and enjoyable. While it took some time for me to warm up to Jeff and Britta, the rest of the gang is what makes this show work to me, especially Abed. The constant pop culture references (the show officially won me over when Troy and Abed sang "Somewhere Out There" from An American Tail), quick-witted jokes, and the un-PCness of the humor blends nicely to create one of the funniest shows on TV today. With Bones phoning in a sub-par season, which can also be said about How I Met Your Mother and The Big Bang Theory, Community is starting to stand out as not only my go-to Thursday night show, but also my must-see sitcom of the week. I kind of wish I'd been watching this show since day one, but it's better to jump on the bandwagon now then never I suppose.